This beautiful square Vera Neumann vintage scarf is in excellent condition! 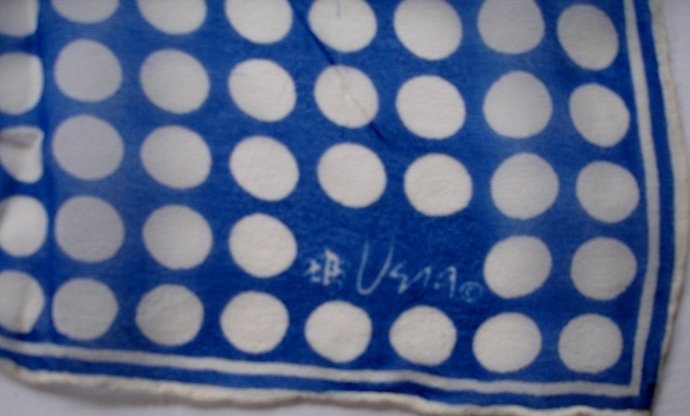 Its a lovely blue and white polka dot geometric pattern. The background is a medium blue color with white polka dots of various sizes. The polka dots start out being small in the center of the scarf and grow in size as they radiate out to the handrolled hem. This will make a wonderful wardrobe accessory. 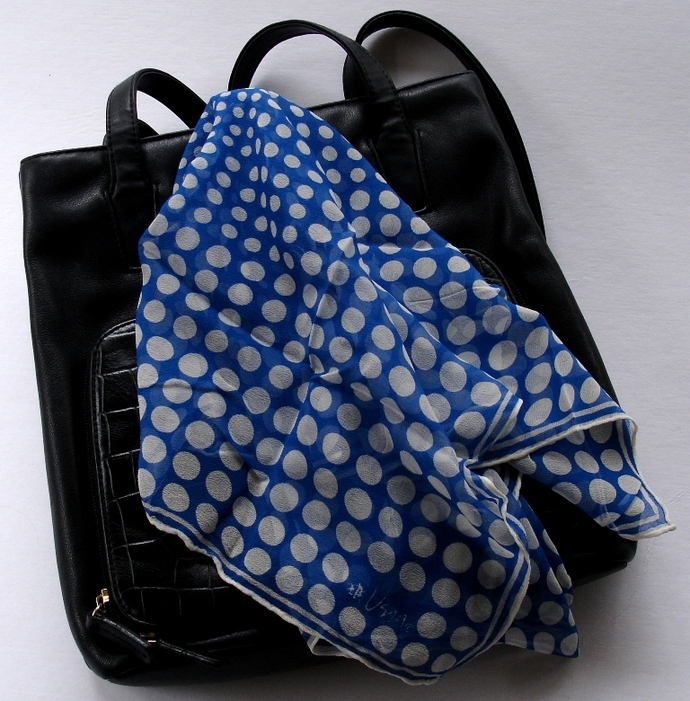 Scarf dates to the 1960s and measures approximately 20 x20 in size and has the ladybug symbol. It has a rolled hem. I could find no tears, pulls or pin holes. It is a really beautiful scarf that will give you many years of pleasure. 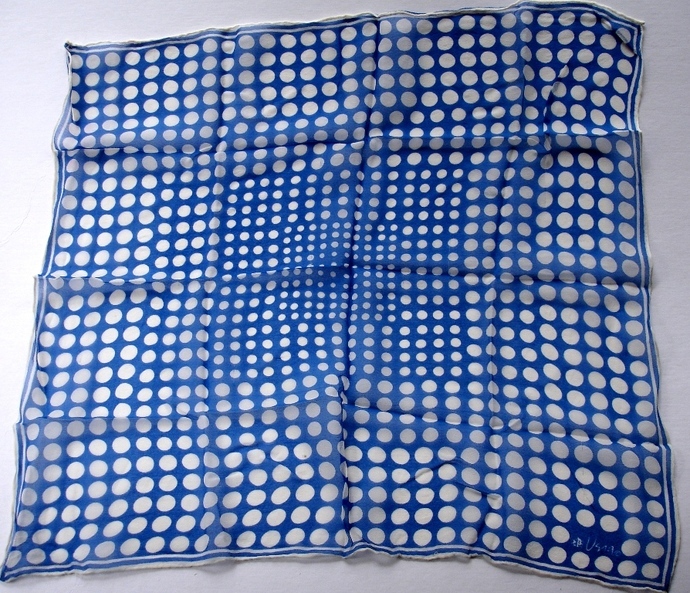 This vintage Vera Neumann Verasheer Blue And White Polka Dot Scarf will ship USPS Priority Mail with Delivery Confirmation coverage in the United States. You can find care instructions for vintage scarves located on our blog, just click the tab marked blog and look under care instructions. If you are interested in dating a Vera scarf, just click on our blog tab above and then click on the instructional guidelines category for our timeline guide using Veras signature, copyright and ladybug symbol to give you an approximate time frame for your scarf. NOTE: Listing is for Vera scarf only! Other items are used for display purposes only ! Thank you ! We always do our best to point out and photograph any flaws that are visible to the naked eye as we in no way wish to misrepresent the condition of this or any other product that we are selling. This is a vintage item and as such can be expected to show some signs of normal wear. Please excuse our dust while we are making some changes to our site! Two Artisan Sisters currently features vintage designer scarves, vintage men's ties, vintage collectible plates, quilting, sewing and cross stitch patterns. We are adding new items frequently so please keep checking back as you never know what uniquely elegant treasure you may find!